I am on the first week of my move from Northern Virginia to Carlsbad California, and I got to witness a historical local event last night. A sign was installed along a highway that goes along the Pacific Coast and through towns as it winds through the way. 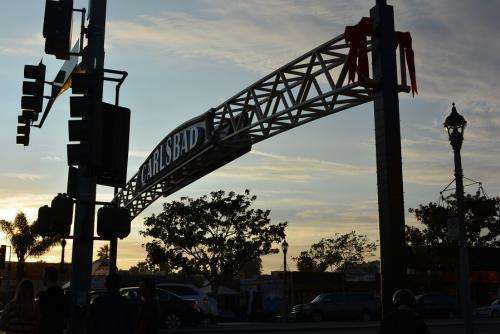 It’s something of a replica of a sign naming the Village of Carlsbad that was around approximately 100 years ago. Last night, the town celebrated the lighting of the new sign, for the first time. My favorite travel site doesn’t have a database filled with thousands of hotels or cruises or flights. My favorite travel site doesn’t use words like “amenities,” and it doesn’t change prices on me depending upon the time of day, day of week, week of month, or month of year. There’s no fancy content management system, live support chat, keyword stuffing of page titles or headings or content, and the word “cheap” doesn’t appear in that title the way that it does in most of the pages that you’ll see if you search for “travel” in one of the major search engines. The word “sale” doesn’t show up once on my favorite travel site, and I’m not bombarded with information about how much of a percentage I’ll save on my journeys. There’s no inexplicable lawn gnome, or standard stock image of an operator with a headset, or Canadian celebrity, or “top deals” or “packages” on its pages. If you visit my favorite travel site, you may find yourself imagining that you can smell the salt air wafting through your windows. You may find yourself hearing people enjoying shops and cafes and life, echoing through roads empty of cars, filled with laughter and joy much like they were centuries ago. You may not feel like a tourist at all. A local environmental group in my area does a wonderful job of showing off information about upcoming events. Their calendar of “events to come” include things like an Annual Land Trust Conference, a local food forum addressing initiatives to get people to buy food locally to benefit the region economically and environmentally, an educational program about sharing the area with bears, and many others. The announcements provide details about what will be covered at these conferences and gatherings, and for some of the larger events, information on how to become a sponsor, how to register, as well as information about travel and dining and accomodations. Once the date of an event has come and gone, pages about it disappear from the site completely, as if it never happened. 2. Find out if the Gender Genie can predict the gender of your blog’s author. 3. Gauge how well the HTML or XHTML of your blog validates with the W3C Markup Validation Service. What Kind of Personality Does Your Website Have? Websites, like people, have personalities. They can’t help it, they just do. I’ve looked at a lot of websites over the past few years, and sometimes wondered about the personalities of the sites that I’ve seen. If you take a close look at a website, can you describe its personality? Does it attempt to evoke emotions in visitors or persuade them with facts? Is it cold or warm and welcoming? Does it use humor or fear or anger when communicating with visitors? Author Bill SlawskiPosted on 01/16/2009 12/03/2018 Categories Design and Development43 Comments on What Kind of Personality Does Your Website Have?